This striking Vintage Turkish Oushak is like a map of an artist's soul. In muted yet vibrant moss colors and saffron, its centerpiece is a twelve-pointed medallion that is placed like an ornament on top of a daydreamed tree. Vintage Turkish Oushak Carpet – The symmetry is this Vintage Turkish Oushak is simply exquisite. It yields a sense of power to bring balance into the life of a space and those passing in and out of it. Although the colors and themes evoke a feeling of being in nature, the preciseness implies a sense of flawlessness that doesn’t take itself too seriously. The designs and colors have an energizing ability that seems to revive one from the reverie caused by visually tracing over the patterns. It is not an entirely linear piece. The touches of oval, petal and bulb-like shapes welcome you into a kind of garden that is not at all garden-variety. Arrows, spinal bone-like shapes, lotuses and Kabbalah-esque trees of life are all called forth in this magical Oushak rug. It seems to trace patterns of rebirthing cycles from one generation to the next, keeping track of something that can’t actually be measured. The colors seem to carry one off into a semi-tropical region where otherworldly citrus trees where the orchardists are weavers. These greens can only be yielded in quiet and far-off places like islands that are only accessible by flight. 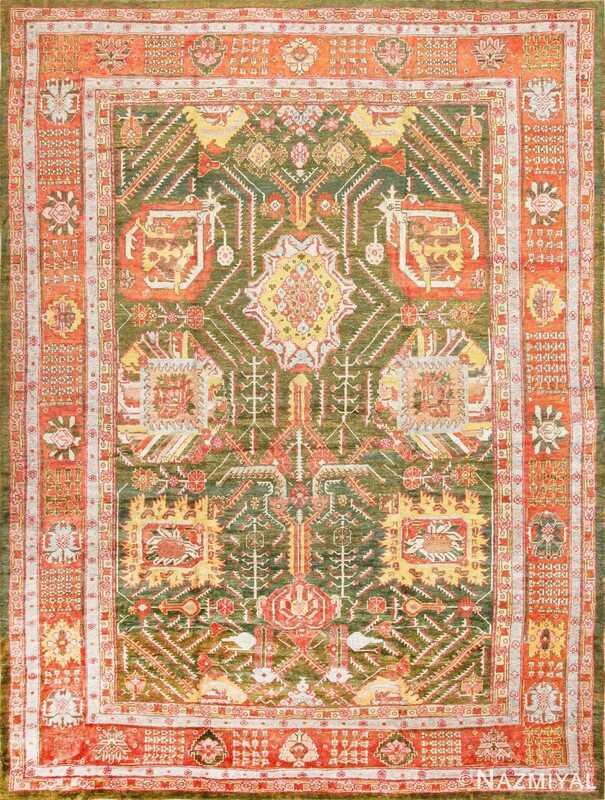 The reddish-oranges of coral, and the slight bits of gold and salmon colors are like a morning sunrise casting it’s light through the sky causing the tiny flowers around the edging of the rug to break through the surface of this earth-like weaving.